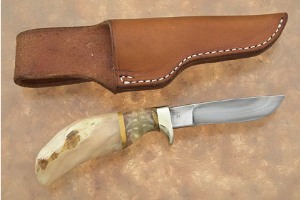 Description: Bill Burke's knives are as high performance as hunters can get. Each knife is pre-tested for edge flex and cutting ability before assembly. The heat treat follows the formulas developed by Ed Fowler, Bill's teacher, and has been proven to create some of the sharpest and most long lasting edges found anywhere. This dressed up Gentleman's Pronghorn has several modifications from Bill's usual knives. 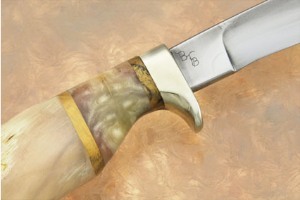 He has replaced the brass guard with nickel silver, which matches the blade in tone. The end cut sheep horn, which is used by both Bill and Ed Fowler, has been surrounded by osage orange spacers. 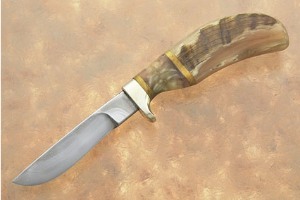 The sheep horn has been smoothed on the right side and has a translucent quality that is very dramatic. Lastly, Bill has given the handle a lacquer finish, resulting in a smooth, highly polished appearance. Excellent fit and finish throughout. 0.296875 0.091796875 296.875 91.796875 Trailer Started. 0.533203125 0.236328125 533.203125 236.328125 Trailer Completed.